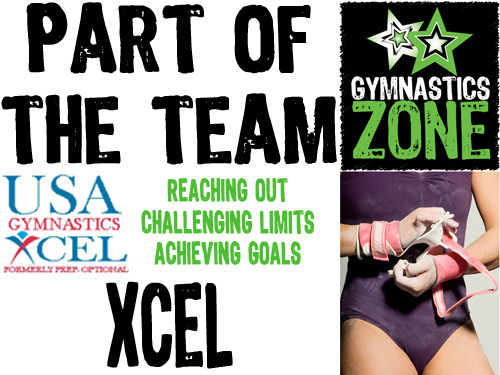 The Gymnastics Zone is pleased to announce that there will soon be a second Xcel Competitive Team! Response to our 10 years & up Xcel Team has been so great that we will be holding tryouts for a new team for younger gymnasts ages 6-10. Please sign up at the front desk if you would like to attend tryouts. Parents are required to attend a brief informational meeting during the first half of testing upstairs in the Party Room beginning at 5pm. This is a wonderful opportunity for both our Recreational and Pre-Team gymnasts who love their sport and have a competitive spirit but can't put in the longer workout hours required for the Junior Olympic Team Program. After tryouts, gymnasts will be notified via mail of their placement. The Xcel Team competitive season runs January through March with Championship meets held in early to mid-April. A team sleepover will be held on December 28th to welcome all new team members!